The beginning of a new year often motivates us to make positive changes in our lives. These changes are often to improve health or fitness, or to spend more time with family and friends. In the spirit of New Year's Resolutions, we've put together a few items that we could all add to our lists this year to improve not only our cat's health, but our relationships with these important members of our families. Interactive Cat Toy. Click on the photo for a link to others! Give your cat(s) something to do with their time while you are away. Even though they can sleep 16-20 hours a day, they still could benefit from a little mental stimulation while the family isn't home. There are so many interactive toys available now that are safe for cats to play with unsupervised. To keep them interested, put these toys away when you are home, and only put them out right before you leave. Save the balls of yarn, ribbon, and fishing pole-type toys for supervised play sessions. Hiding some cat treats throughout the house right before you leave in the morning is another great way to keep your cat stimulated while you're away. Spend more quality time with your cat. Everybody's busy, but committing a small chunk of time each day for quality time can really go a long way not only for their mental health, but for your health too! This is where those "use with supervision" toys come in. Toys on a string and fishing pole-type toys are great fun and exercise for cats, especially when powered by their humans (just put them away when you are done....cats do like to eat string). Another fun option....don't laugh... but teaching your cat a trick is great mental stimulation and a very good relationship building exercise. Here's a video of a series of tricks by supercat Zucca (my favorite is "Pick the Queen"). The tricks don't have to be elaborate to benefit you and your cat. All you need are some treats and a hungry cat! Make a commitment to your cat's health (We are a veterinary hospital, so we have to include this part). Prevention and early detection are the keys to feline health success. Put your hands on your cat....every part of your cat....on a regular basis. Do this in the form of a mini cat massage, feeling around for any lumps, bumps, or signs of discomfort that might signal a problem. Any concerns should prompt a call to your veterinarian which brings us to our final resolution. Get to know your veterinarian, and veterinary staff. Don't wait for a CATastrophe before you and your cat get in to the vet's office. If your cat hasn't seen a vet for a year (or 2 or 3 or 5 years for some folks), make an appointment for a general health exam. Healthy cat visits are not about getting "shots" anymore. 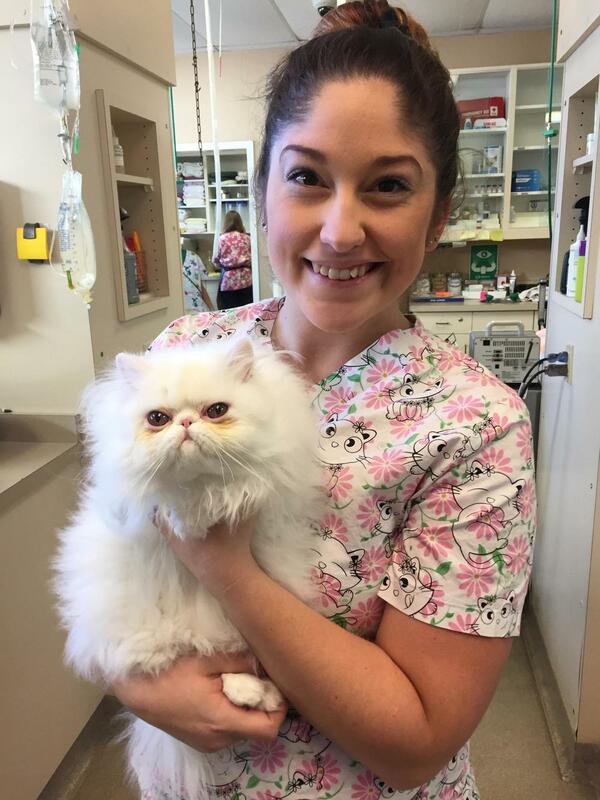 They are about evaluating the special needs of each cat on an individual basis, and identifying health issues before they become more serious. As always, please share these resolutions with other cat-oriented folks. You never know who you might inspire. We'd also love to hear about your cat resolutions, so please leave a comment if you like. And we can't wait to start seeing videos and hear about what tricks you all have taught your cats!